An Expert Author will have no problem creating original content, day in and day out. The mistake some make is bringing up their website or product too soon. The Article Body should contain your best content about the article’s topic, but most importantly it should be free of promotion. Provide relevant content that relates to both your readers and your niche. Your articles should never be low quality or fail to deliver any informative content. Ensure your content is helpful to your readers and truly stands out! If you need some guidance in this area, here are our Top 10 Ways for Authors to Stand Out in Their Niche. 1. How did you get started in your niche? 2. What keeps you motivated and enthusiastic about your area of expertise? 3. Why should your readers be reading your articles, and not someone else’s? You’re the expert, so it should be easy to promote your niche without using your company name. Promotional hype for a product inside your article is one of the fastest ways to lose credibility in your field. The hype should be focused on your niche. Why is your field so important and relevant in today’s world? The body of your articles should include excitement about the field you’re working in, not what you’re selling. Accidentally promoting yourself can be fairly easy. For example, you could start your article with your name and how you got started in your field. You could also share chapters of your book or details on a product you worked on. This is where you’d be getting ahead of yourself. You need to put yourself in your readers’ shoes. If you’re looking over a fascinating article or product review, you wouldn’t want to be pitched a product in the first few paragraphs. You want to take your time and read it in its entirety, THEN make a decision whether to make a purchase or not. We encourage you to hold off on any promotion until the Resource Box. If your articles are your give then your Resource Box is your take. It’s your opportunity to truly pitch what you’re offering. Here are some real-life examples of how non-promotional content can benefit your audience. Writing articles should give you enjoyment. Choose a niche you’re passionate about. It should be one where you have relevant personal and professional insights and experiences to share with your readers. If you’re only writing in a niche to expand your field and have only a little experience on the subject, your readers will catch on. They want expert material, not a few boring tips that you came across from another author. Be proud of the categories you know well and show how passionate you are about them by providing high-quality and memorable content. The Resource Box at the end of your article is where you can freely discuss yourself, your company, and/or your website. An excellent Resource Box provides just enough information to help your readers discover who you are, yet it encourages them to find out more about you and your expertise. You need to end your article with an impressive message that tells your audience you know what you’re doing and have had long-term success. Back up your article content with information about you and your business. You can also list a couple of links to your website. Click here for more information on how to create the best Resource Box. Your primary purpose in creating articles is to give your readers original content they will remember. Include tips, suggestions, case studies, strategies, and opinions about your article’s topic to make it stand out. Make sure you are adding tremendous value for your readers every time! Feel free to share any questions or comments you have on making the content in your article the highest priority. In what ways can/do you highlight your niche without being promotional? I fully agree, and it is certainly good that you talk against spinning article content. It is so true that it is so easy for us to create original quality content when we ARE experts in our niches, and it is much appreciated that you speak out bluntly against lowering standards in writing more articles on EzineArticles. We all depend on this being a quality site with the best articles, so readers come back for more information every day. Their first thought should actually be EzineArticles when they are looking for an answer to whatever question comes across for them. Thank you for your comment. Creating original content should be a priority. Our Editors come across spun content every day, believe it or not. Each article is thoroughly reviewed and we catch these articles so easily, so we’re still baffled as to why authors still attempt it. Excellent tips I will be to good use as I begin marketing my recently published first novel. I will keep your suggestions and strategies in mind as I kick off my social media and e-mail activities. Thanks for the great approaches! Thanks for these reminders. A blessed Holy Thursday! Very useful reminders. Thanks a lot! You are right, content should be unique, informative and fresh. Many bloggers use old content and spun content which is not good for blog health. You cannot generate output if you use dull content. There is so much to say and write about, one can easily get lost in content. Thanks for these reminders and tips. I liked how samples are given, which are rare or I’ve been looking at the wrong blogs. Thanks for this great article. Thanks for the great tips! I’m guilty of doing it the lazy, impatient way! I thought spinning articles is acceptable? Didn’t know it’s the opposite. To clarify, EzineArticles does not accept spun content. Spun content is not original and the grammar reads very poorly. All content needs to be 100% original to our members, with the exception of a few lines of quotes with the appropriate references. I’m glad you are now aware of the guidelines, Esme! Thanks for the comprehensive article. It really gave me a clearer perspective and guidelines on how to do promotion. Thanks for sharing such insightful information. I haven’t followed a consistent format and it’s probably why my results are inconsistent. I love the tips you summed up towards the end of the article “Include tips, suggestions, case studies, strategies, and opinions about your article’s topic to make it stand out. Make sure you are adding tremendous value for your readers every time!”. That sounds like a winning strategy. Thanks again for providing guidance. Very helpful article, helpful for me when writing my articles. Lots of information and good advice. Great tips on writing original, meaningful content. Truly inspiring article. Thanks to you I know what I’m doing now. Very nice feeling to help people. Thank you. I enjoyed reading this article very much, As I have just joined EzineArticles it has helped me understand the right way and the wrong way to promote my articles. Steve, I also often visit EzineArticles. It’s a great platform for new bloggers to make them follow the right path towards success. Readers always appreciate only quality content. Thanks for the post. My question is this – Can I repost articles from my blog. I am the original author. Good question! 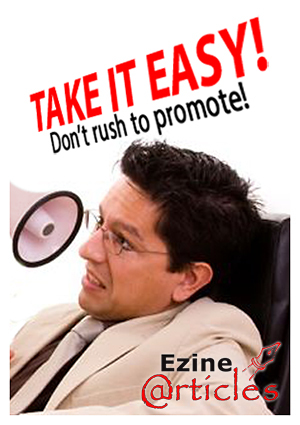 You are more than welcome to use your content on both your website or blog and http://EzineArticles.com. Seriously, spun content is hilarious and may affect your website reputation. I totally agree with all points with respect to content. It is essential that your content is free from plagiarism and user engaging. Thanks for the tips on presenting an eye catching Article without necessarily promoting my niche. Never too old to learn and I’m glad to be a part of this Community and to make my contribution in rich content Article writing. Thank you for sharing these tips. We all know spin content is very bad for our site. Great article thank you, helping everyday! Thanks for that wonderful article. The issue taken up by you has been faced by every content writer, the right way and time to promote product or services and to make sure you don’t overdo. I myself have struggled with this dilemma and hopefully your article will ease the process for me in future. Very interested information that will help any Author in writing articles. It is helping me. I know more now about article writing than I did before. This is knowledge that anyone can benefit from. I love to write articles about what I am passionate about. I love to write articles that will help others in the niche that they are in. You guys are outstanding and keep up the good work. Yeah, very helpful site for me, I have been here the last couple of months. I enjoy to read your posts, keep writing for us. Thank you! William Zinser said it very well, and got it right, when he quipped in his book, “On Writing Well,” that, “good writing is very difficult to achieve.” As Stephen King said in his book “On writing: A Memoir of the Craft,” “any intelligent person can learn to become a good writer, but becoming a great writer requires a great deal more effort.” To approach this concept of writing, you might ask why most teenagers and adults don’t read Charles Dickens for entertainment and relaxation. Well, the answer lies in the difficulty most 21st Century Americans have in reading Dickens; the syntax, sentence structure, and his convoluted sentences are definitely not for the average American mind. Steinbeck, Faulkner, Sinclair Lewis, Thurber, Fitzgerald, Poe, and Joyce, the great writers, are hardly read for entertainment in the present world. They are, instead, the subject of high school study. They are required reading, which immediately makes consuming them a task rather than a pleasure. A good writer spends as much, or more, time reading the classic literature of the master writers than he spends writing, and, by reading, avails himself of the minds and products of genius. Well structured, grammatically correct sentences created using a diverse and eclectic vocabulary acquired through reading is the goal of a good writer. Epiphanies come to good writers allowing them to blossom as great writers over time. There are no tricks to writing well. It only requires dedication to the craft and, if your make it so, the art of written rhetoric. Thank you Derek. All of the information you provide is so helpful. I can’t figure out my best use of the resource box. I include my primary website although many of my articles do not have anything to do with any of my inventions and I am never selling anything. Thank you. Thank you Derek. All of the information you provide is so helpful. It is very nice to read such an article from you. Thanks for the comprehensive article. It really gave me a clearer perspective and guidelines on how to do promotion. You’ve made some good points there. I looked on the internet for additional information about the Blog and found most people will go along with your views on this website. Your suggestion for article promotion is awesome. In the future I will definitely use your tips. Lots of information I got from this article. Thanks a lot. Excellent articles. What one may get as a lesson after reading this article is that our readers do not want ads and promotion. We must focus on quality content. If we get much more readers then we will be in position to add promotions. A DIY approach may be much more effective in this sense. Writing articles should give you enjoyment. Choose a niche you’re passionate about. It should be one where you have relevant personal and professional insights and experiences to share with your readers. Great advice and one lovely article. Yes, unique contents key to success and adding a single link to your site provides excellent exposure. Always keep in mind that visitors are our assets. Simply publishing an article is not enough. Try to discuss new updates, innovations, focus on a specific niche and discuss what users want in the start of the article to build his/her confidence that he/she has landed on the right page. In last, do not panic if you are failing to bring users on your page. Try to refresh your page, focus your keywords and wait for some days. You will get success. Modern SEO strategists are not believing in the original content. The scraping and spinning of articles are normal nowadays. But it won’t give long-lasting benefits. But it is not the case with original articles. If you are passionate about the subject, it won’t be harder to come up with outstanding stuff which will give better results. I am highly convinced with this post which clearly explains the importance of the quality of content of the article rather than marketing. Quality will take care of the rest. So concentrate on quality. Thanks so much, your advice is well taken. Keep up the tips. Rain. You are making your points in your articles. I guess that the first 10 mistakes and how to correct them are inspired from your articles.